Players and fans alike were left disappointed earlier today when one of the opening games of the 2015 Women’s County Championship – Middlesex v Berkshire at Edmonton Cricket Club – was abandoned without a ball being bowled. 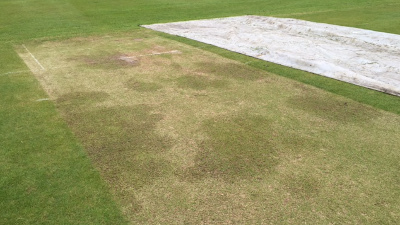 While the rain had largely disappeared by the time play was due to begin at 11am, it was announced shortly afterwards that the pitch was unplayable after the overnight downpour seeped through holes in the covers. Newly-appointed Middlesex captain Izzy Westbury, due to lead the Meatballs out for the first time today, said that she was disappointed with the abandonment and hoped to rearrange the fixture later in the season. Fans who had travelled to watch the game – one from as far away as Ipswich – were equally frustrated. Edmonton do not currently have fully-functioning covers as their last set were vandalised and they are still awaiting the arrival of new ones. Berkshire have the chance to redeem their disappointing start to the championship tomorrow in their fixture against Surrey at North Maidenhead CC.